As the number of people of color rapidly grows within the US population, health providers in these communities have become increasingly aware of the need to address the concerns and problems particular to each group. It's also become clear that as the delivery of our health care systems evolve, a new approach must be summoned to build systems both cost-effective and socially responsible. Community Health Psychology offers a new and different perspective for redressing the gaps in our systems of care. 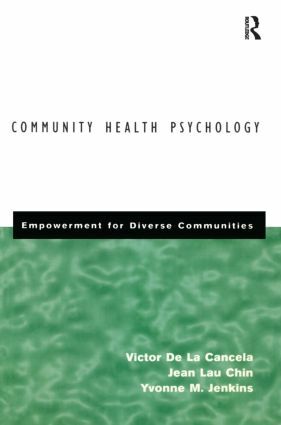 The authors contend that in order to begin an attempt at eradicating the more intractable societal problems, health providers need to tailor themselves to a more culturally competent approach, which addresses all members of a community they claim to serve. Who are Students of Color? Victor De La Cancela is at Salud Management Associates and is Assistant Clinical Professor of Psychiatry at the College of Physicians and Surgeons, Columbia University. Jean Lau Chin is Executive Director at the South Cove Community Health Center in Boston. Yvonne M. Jenkins is Associate Psychologist at Harvard University Health Services. The three authors are widely published, including a co-authored book, Diversity in Psychotherapy: The Politics of Race Ethnicity and Gender (1993).